Our next guest, Jennifer Loewenstein, wrote in a Counterpunch article titled Heading Towards a Collision: Syria, Saudi Arabia, and Regional Proxy Wars. In it, she wrote: there is no question, for example, that the U.S. invasion of Iraq in 2003 played a role in the creation of the Islamic State and the sectarian warfare that is raging in much of the region today, particularly in Syria and Iraq. Now we are going to unpack what she meant by that. And for that, Jennifer Loewenstein joins us. She is a human rights activist and faculty associate in Middle East studies at Penn State University, and she is also a journalist and has lived in the region extensively. Thank you so much for joining us, Jennifer. JENNIFER LOEWENSTEIN: Thanks for having me. LOEWENSTEIN: So Jennifer, let’s unpack that. You particularly identified the Iraq War of 2003 as a step in the process of the sectarianism we are now seeing raging across the region. What did you mean by that? Explain it. LOEWENSTEIN: Well, historically there have been ups and downs and sectarian strife in the Middle East between Sunni and Shia Muslims. So it hasn’t always been peaceful and calm, and it hasn’t always been raging the way it is today, where you have Sunni and Shia pitted against each other in, in very violent conflicts. But 12 or 15 years ago in Iraq, for example, there were Sunni and Shia Muslims living in the same neighborhoods. They were sharing the same mosques. They were intermarrying, they were going to the same schools. Sectarianism was not, you know, it wasn’t anything on the, that had exploded onto the scene years before. There weren’t sectarian fights going on in Iraq when we invaded. Things were fairly calm. In fact, some veteran journalists were saying, there’s not going to be a civil war in Iraq because Sunnis and Shias are, are too close, and they worked together closely for many decades, and that’s just not a possibility. PERIES: In the last 16 years, somehow, you attribute the 2003 Iraq invasion to the kind of divide we’re experiencing today. So tell me exactly, what is it that the U.S. policy in the region and this war, invasion, did in order to enhance sectarianism? LOEWENSTEIN: Well, first of all you have to understand that Iraq was a country ruled by Sunni Muslims, primarily. Saddam Hussein was a Sunni Muslim. But the majority of the population of Iraq is Shia. So already, I think if there were any sectarian problems prior to the U.S. invasion it was that Saddam Hussein did discriminate against the Shia. When the Americans invaded, of course what they did was go after Saddam Hussein and capture him, ultimately kill him. And in the process of that, it abolished the two bastions of secular nationalism in Iraq, the civil service and the military. And when you get rid of these pillars of society, first of all, you’re going to cause a lot of instability within a country. It proceeded, then, to back a terribly corrupt government, headed by a Shiite leader, president, and who went on to then discriminate and really dehumanize the Sunni Muslims. And the American supported this. They didn’t, they didn’t try to stop it. Then the Maliki regime in Iraq was terribly discriminatory. And the effect of this was that–first of all, remember, many of the people who had been involved in the Baathist regime of Saddam Hussein were imprisoned in places like Abu Ghraib and in Camp Bucca, in the south of Iraq. And these prisons became a kind of, they were internment camps. But they became schools for radicalism of people who were often not guilty of anything other than being even loosely associated with, with the Sunni, prior Sunni regime, the Baathist regime. And if they had feelings one way or another towards the Americans, those feelings were primarily bitterness. I mean, what I’m trying to say is that the Sunni radicalism that became, or that evolved into al-Qaeda and then to ISIS, it didn’t start out as a religious phenomenon. It started out as bitterness towards the invasion and occupation of Iraq by the Americans. It was a very natural response, and an ideological response, perhaps. The religious overtones came later as these prisoners, together, schooled and taught each other. And you know, out of these conditions you get today most of the leadership of ISIS. Most of it is Iraqi. Abu Bakr al-Baghdadi is right out of Camp Bucca. He was one of the leaders there. And in other words, the United States paved the way, by its actions against the old regime in Iraq, to the sectarianism that we have today. It broke open old wounds, old conflicts, into a new scenario in which you did have Sunni governments that were very discriminatory. And you had–I mean, Shia governments that are very discriminatory today. And a lot of alienated Sunni Muslims, not just former Baathist members, or Baath party members, but also Sunnis who resented the discrimination, which of course is a natural reaction, too. PERIES: These social conditions that you describe pre-invasion in Iraq was also, I think, replicated in places like Libya, and particularly in places like Syria. You know, these were largely modern societies, to a great extent. Women were able to go to school and study, go to university, and practice professions. And things have dramatically changed in the region as a result, as you say, of this invasion and the sectarianism it has flared. Now, coming back to today and what has recently happened in Saudi Arabia with the execution of the cleric and 46 other people, this has also flared up further sectarianism in the, in the region. Connect the dots for us in terms of what has happened in the region that brings us to this kind of action on the part of the Saudi Arabian government, and also the rise of ISIS today. LOEWENSTEIN: Well, there are a lot of dots to connect, and it may be worth it to start in the present and move backwards. There is no question in my mind, and many other people’s, that the Saudis deliberately, they calculated this execution of the Shia cleric Nimr al-Nimr. He was a prominent Shia cleric in the eastern province of Saudi Arabia, where most of the Shia minority within Saudi Arabia live. They are heavily discriminated against, they have always been. So in Saudi Arabia you do and have had sectarianism for a long time. Saudi Arabia is an extremely repressive country. The United States State Department report on Saudi Arabia and human rights is scathing. But we of course don’t get any of this in the media. But what I was saying is that Saudi Arabia arrested this cleric in 2012 for, you know, during, or in the aftermath of, the Arab Spring for expressing dissatisfaction with the Saudi government for demanding the right of, the right to dissent, or equality and human rights in the country, and at one point even said that the Shia minority in Saudi Arabia should secede from Saudi Arabia because they were being treated so poorly. And this is not something that the Saudi Arabian government could tolerate. So Sheikh Nimr was arrested and tortured, and ultimately executed last week, on the 2nd of January. This week. They knew that this would provoke a very strong reaction in Iran. There’s no question that it would provoke a strong reaction in Iran. And it would have, even had the circumstances in the Middle East been much calmer. What they did, though, is they blamed Iran for their severing of ties with Iran. I can be more clear. Saudi Arabia then cut diplomatic ties with Iran, because a popular protest emerged after Saudi Arabia’s execution of Nimr. 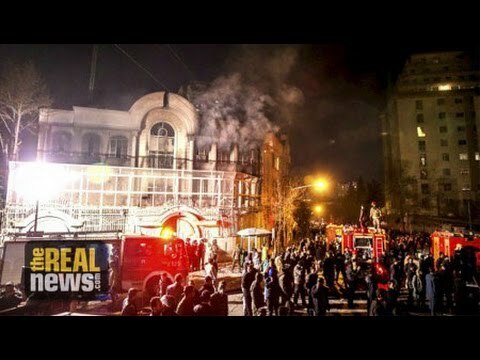 Popular protest arose in Tehran, in which civilians targeted the Saudi embassy. They threw firebombs at it. The embassy caught fire. The protests were violent. And interestingly, the Iranian authorities tried very hard to stop it., and in fact condemned it very harshly. But that didn’t mean anything to the Saudis. They just used the attack on the embassy as a pretext to sever diplomatic ties with Iran. And that’s very important, because Saudi Arabia has been looking for reasons to sever that tie for a long time. PERIES: So, so the execution of the cleric was to trigger this cutting of ties with Iran, which they were somehow forced to accept. You know, when the Saudi king came to Washington, met with Obama, and Obama convinced him to accept the Iranian nuclear deal, this was something that they shook on in terms of the Saudis are now accepting the Iranian peace deal moving forward. But since then they have been looking for a reason to sever relations. And you think they carried out the execution in order to trigger that cutting of ties. LOEWENSTEIN: I’m sure of it. I’m sure of it. I want to just cut in for a minute, though, and say that there were also domestic reasons for the execution. I think this is one of the things that few people understand, is that this execution that recently took place against the Shia cleric was, was carried out not just with a mind to cause this rift between Iran and Saudi Arabia, but also for internal reasons within Saudi Arabia and for more international reasons having to do with the [Syrian] civil war and the proxy parties involved in the war, including the United States and Russia. PERIES: And you say the internal domestic reasons–elaborate on that a bit more. LOEWENSTEIN: For the last year, or since King Salman came to power in Saudi Arabia, the regime has become much more aggressive and, I think, brash in its actions. And there have been many suggestions that top-level Saudi officials, members of the Saudi royal family, are unhappy with King Salman’s rule and the rule of the deputy crown prince, Mohammad bin Salman, who is the architect of the Yemen war. A terrible war, a bloody war that in the opinion of many should never have started. So what’s happened is that within the kingdom itself there has been a feeling that the leadership is unstable. That there’s some uncertainty of whether King Salman and Prince Nayef, the interior minister, also a very important figure, are going to stay in power. Do they have the strength to stay in power. Well, executing 47 people in one day is a way of sending a message to the people of Saudi Arabia. It’s saying we’re strong, we’re confident, and we will not tolerate any dissent within the kingdom whatsoever. So this message went out not only to the general public in Saudi Arabia, it went out to people who oppose the Saudi regime for a number of reasons, including its, its terrible human rights record. And it also reached the Shia population in the East, obviously, and discouraged any further dissent. That’s a very important point to, to remember, that this was a domestic factor involved, or that stimulated or encouraged the execution of Nimr. And I think that’s lost on a lot of people. Now we have to wonder if Salman, Nayef, and Salman’s nephew Mohammad bin Salman, if these people are going to continue to have a hold on power, or whether there is some real behind-the-scenes struggle going on. We don’t know, but obviously we’re being made to think that there is not. PERIES: Jennifer, this is an issue we’re going to be covering on an ongoing basis, so I hope you join us very soon, again. LOEWENSTEIN: Thank you. Thank you very much. Jennifer Loewenstein is a faculty associate in Middle Eastern Studies at Penn State University. She is a freelance journalist and has been a human rights activist for more than 30 years with a particular focus on the Middle East.